Rucola, arugula, rocket, whatever you chose to call it you can’t deny it’s deliciousness. It’s aromatic, zesty and pepperry and one of a kind. There’s no other green quite like it from a flavour perspective.. Besides being delicious, arugula has many healing properties and is loaded with vitamins,minerals and nutrients like iron, vitamin K, and folate to name a few. It’s great for digestion, hydration, and has a wonderful cleansing effect on the body which makes it great for the liver. 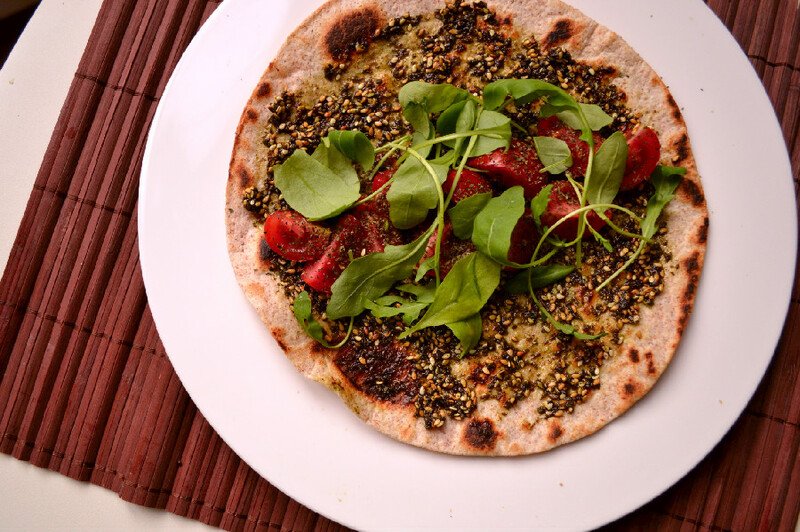 We love arugula and eat it in abundance during the summer months, as it makes a wonderful base for a green salad and adds flavour to a grain or pasta salad, but you can also toss it in smoothies, atop a pizza, or you can enjoy it with za’atar spice and tomatoes wrapped in pita or piadina (an Italian flat bread) like I did here. 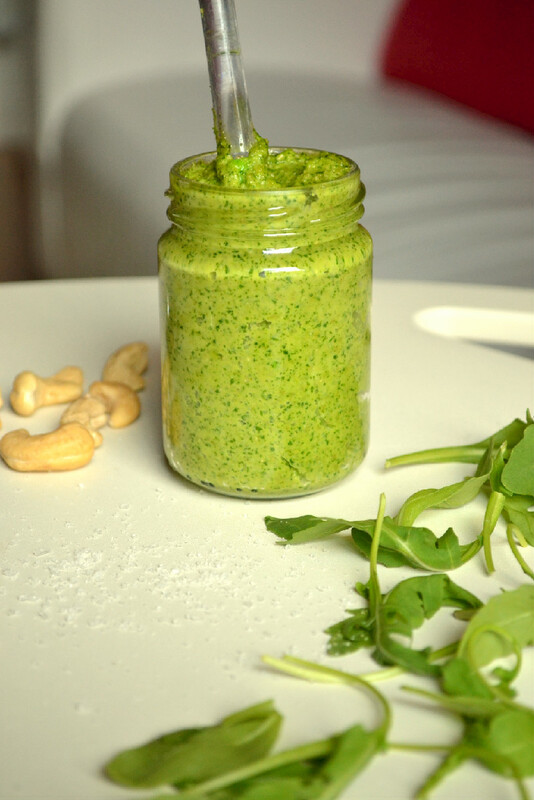 One of the recipes that I make often all summer long and occasionally throughout the year is this Peppery Arugula & Cashew Pesto. It’s a fantastic addition to hot or cold pasta, tossed into a grain salad or spread into a wrap or sandwich. This particular preparation is “creamier” than a traditional pesto as I used very little oil to keep it relatively “light” but you can play around with the amount of oil used to get the consistency you’re looking for. See notes and tips in the recipe card. 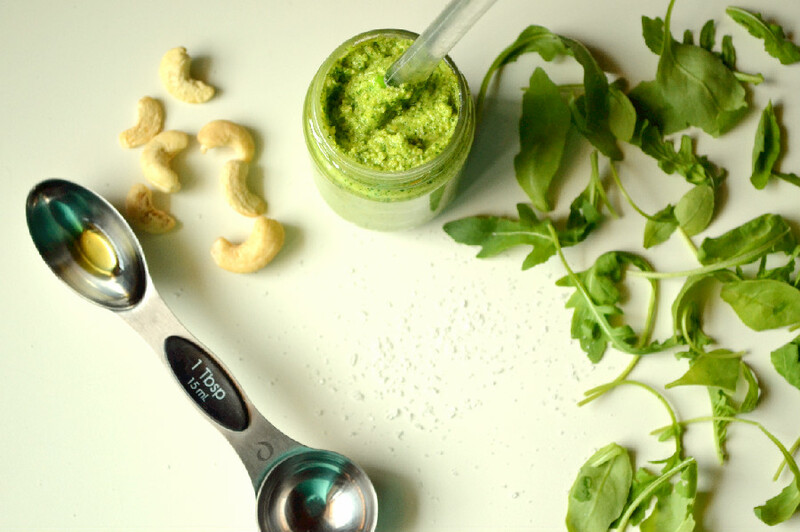 In a food Processor: Add cashews, arugula, olive oil, sea salt and garlic to a food process and process to a smooth consistency. Add lemon juice if using and a little bit of water and/or extra olive oil and mix with a spoon until you have the desired consistency. Adjust seasoning to taste. Keep refrigerated in an airtight container or jar, serve with warm, hot or cold preparations. This recipe was inspired by the traditional Italian recipe which is made with copious amounts of olive oil and parmigiano reggiano and/or pecorino. I used cashews and only two tablespoons of olive oil, but like in any good Italian recipe, the measurements are just indicators. Trust your gut and go with your instinct when you’re making this pesto or any other recipe for that matter. The amount of oil you use will depend on the consistency you want. Just be sure to make any adjustments in small quantities until you get the desired consistency. 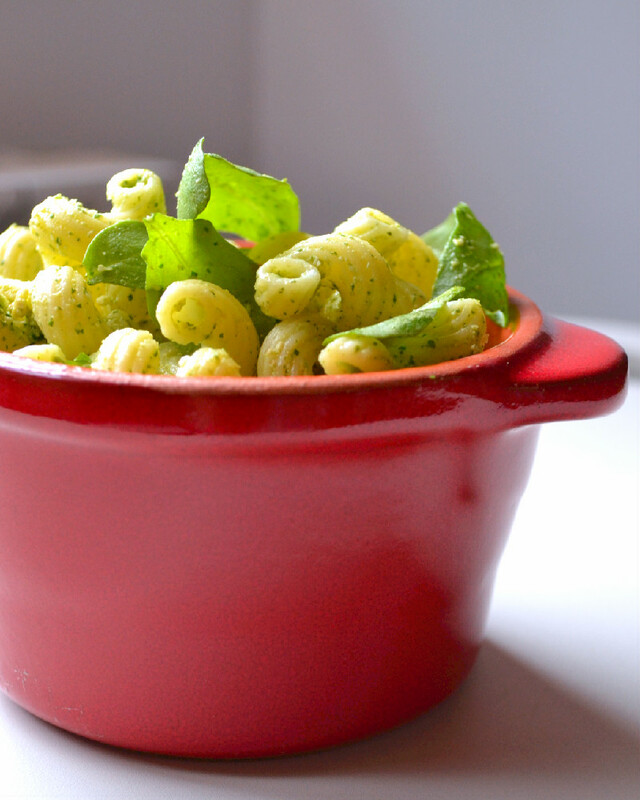 If using the pesto in a cold preparation, remove it from the refrigerator at least 30 minutes prior. Olive oil solidifies slightly in cold temperatures which will cause the sauce to thicken. If it’s still too thick to toss, measure out the quantity desired and add an additional drizzle of olive oil and/or lemon juice. If using the pesto in a hot preparation, like a warm pasta dish, you will want to dilute and reduce the pesto in a little bit of pasta cooking water to achieve the desired consistency, being careful not too add too much water or it will become runny.